Not to be confused with University of San Francisco or San Francisco State University. The UCSF School of Medicine, the oldest medical school in the Western United States, is the top recipient of NIH funding as of 2017. U.S. News & World Report ranks it #5 on their "Best Medical Schools: Research" and #2 on their " "Best Medical Schools: Primary Care." The UCSF Schools of Dentistry, Nursing, and Pharmacy have the highest NIH funding in their respective fields. The UCSF Graduate Division offers 19 PhD programs, 11 MS programs, two certificates and a physical therapy program. The UCSF Medical Center is the nation's 6th-ranked hospital and California's highest-ranked hospital according to U.S. News & World Report. With 25,398 employees, UCSF is the second largest public agency employer in the San Francisco Bay Area. UCSF faculty have treated patients and trained residents since 1873 at the San Francisco General Hospital and for over 50 years at the San Francisco VA Medical Center. Toland Hall in 1887. Toland Hall on Stockton was the first home of the school, before its transfer to the Parnassus campus. 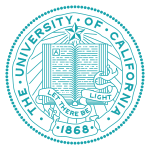 The University of California was founded in 1868, and by 1870 Toland Medical School began negotiating an affiliation with the new public university. Meanwhile, some faculty of Toland Medical School elected to reopen the Medical Department of the University of the Pacific, which would later become Stanford University School of Medicine. Negotiations between Toland and UC were complicated by Toland's demand that the medical school continue to bear his name, an issue on which he finally conceded. In March 1873, the trustees of Toland Medical College transferred it to the Regents of the University of California, and it became The Medical Department of the University of California." 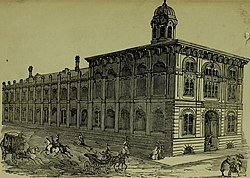 At the same time, the University of California also negotiated the incorporation of the California College of Pharmacy, the first pharmacy school in the West, established in 1872 by the Californian Pharmaceutical Society. The Pharmacy College was affiliated in June 1873, and together the Medical College and the Pharmacy College came to be known as 'Affiliated Colleges'. The third college, the College of Dentistry, was established in 1881. 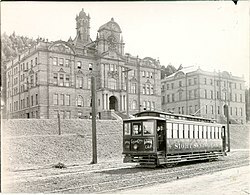 Until 1906, the school faculty had provided care at the City-County Hospital ( San Francisco General Hospital, 1915-2016, but Zuckerberg San Francisco General Hospital and Trauma Center (SFGH) since 2016), but did not have a hospital of its own. Following the 1906 San Francisco earthquake, more than 40,000 people were relocated to a makeshift tent city in Golden Gate Park and were treated by the faculty of the Affiliated Colleges. This brought the school, which until then was located on the western outskirts of the city, in contact with significant population and fueled the commitment of the school towards civic responsibility and health care, increasing the momentum towards the construction of its own health facilities. Finally, in April 1907, one of the buildings was renovated for outpatient care with 75 beds. This created the need to train nursing students, and, in 1907, the UC Training School for Nurses was established, adding a fourth professional school to the Affiliated Colleges. The schools continued to grow in numbers and reputation in the following year. One notable event was the incorporation of the Hooper Foundation for Medical Research in 1914, a medical research institute second only to the Rockefeller Institute. This addition bolstered the prestige of the Parnassus site during a dispute over whether the schools should consolidate at Parnassus or in Berkeley, where some of the departments had transferred. The final decision came in 1949 when the Regents of the University of California designated the Parnassus campus as the UC Medical Center in San Francisco. The medical facilities were updated, and the departments returned to San Francisco from Berkeley. During this period a number of research institutes were established, and many new facilities were added, such as the 225-bed UC Hospital (1917), the Clinics Building (1934), the Langley Porter Clinic (1942) and the Herbert C. Moffitt Hospital (1955). In 1958, the addition of the Guy S. Millberry Union offered dorms and services for students. The school gained more independence in the 1960s, when it started to be seen as a campus in its own right instead of as the medical center of the UC system. The four departments were renamed as "School of ..." and the Graduate Division was founded in 1961. Further along this line, in 1964 the institution obtained full administrative independence under the name University of California, San Francisco Medical Center, becoming the ninth campus in the University of California system and the only one devoted exclusively to the health sciences. The first Chancellor under the new independent configuration was John B. de C.M. Saunders, previously Provost, who had a strong preference for medical training over research. This stance led to his resignation and the naming of Willard C. Fleming, DDS, as the second Chancellor in 1966. Fleming brought balance between clinicians and researchers and a new found stability to the administration. By the end of the 1960s, the university was starting to become a leading research center, also bolstered by the opening of Health Sciences East and Health Sciences West the same year. The 1970s saw a dramatic expansion of UCSF, both in its medical capacities and as a research institute. The increase in researchers, physicians and students brought a need for additional space. The nursing school opened its own building in 1972 and the medical center opened the Ambulatory Care Center in 1973. The discovery of recombinant DNA technology by UCSF and Stanford scientists in the mid-1970s opened many new avenues of research and attracted more people. On the clinical side, great advances in patient care, diagnostics, and treatments advanced UCSF's reputation in the health field. 1975 also saw the opening of the UCSF Center in Fresno. Julius R. Krevans, the fifth Chancellor from 1982 to 1993, was a strong advocate of biomedical research and public policy in the health sciences. During his tenure, UCSF rose to become one of the leading recipients of NIH funding. This led to the need for new space, and additions included the Marilyn Reed Lucia Child Care Center in 1978, the Dental Clinics Building (1980), the new Joseph M. Long Hospital in 1983 (which was integrated with the existing Moffitt Hospital), Beckman Vision Center and Koret Vision Research Laboratory (1988), and Kalmanovitz Library (1990). 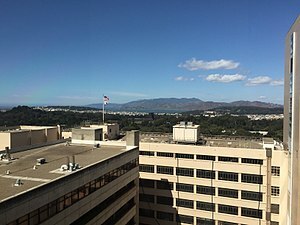 Due to the space constraints of the Parnassus Heights campus, UCSF started looking into expanding into other areas of the city. The university opened UCSF Laurel Heights in 1985 in the Laurel Heights neighborhood. Initially intended for pharmacy school laboratory research and instruction, neighborhood concerns pushed the university to instead employ the building for academic desktop research, social and behavioral science departments, and administrative offices. On the western side of the city, the university acquired Mount Zion Hospital in 1990, which became the second major clinical site and since 1999 has hosted the first comprehensive cancer center in Northern California. Under the chancellorship of Joseph B. Martin, UCSF engaged in a health merger with Stanford Health and laid the groundwork for the expansion into Mission Bay. A pivotal moment in UCSF history was the deal between Vice Chancellor Bruce Spaulding and San Francisco Mayor Willie Brown for the development of the Mission Bay campus in 1999. The development of a second campus in San Francisco was planned carefully and with business and community input. The Mission Bay neighborhood was occupied by old warehouses and rail yards. Initially, the campus consisted of 29.2 acres donated by the Catellus Development Corporation and 13.2 acres donated by the City and County of San Francisco. A later addition of a 14.5-acre parcel brought the total campus area to about 57 acres. The Mission Bay expansion was overseen by a one-year chancellorship of surgeon Haile Debas. Under his guidance, UCSF further increased its lead in the field of surgery, transplant surgery, and surgical training. The Mission Bay Campus doubled the university's research and provided new opportunities for biomedical discovery and student training. The first phase of construction cost $800 million and included four research buildings, a community center, a student housing complex, two parking structures, and development of large open spaces. In 2009, Susan Desmond-Hellmann became the ninth Chancellor and first woman to lead UCSF. She was tasked with guiding the university through the aftermath of the financial crisis of 2007–2008. In the same year, UCSF professor Elizabeth Blackburn won the Nobel Prize for Medicine and in 2012 UCSF professor Shinya Yamanaka won the Nobel Prize in Physiology or Medicine. The 2010s saw increased construction and expansion at Mission Bay, with the Smith Cardiovascular Research Building, the UCSF Medical Center at Mission Bay, the Benioff Children's Hospital in 2010, the Sandler Neuroscience Center in 2012, Mission Hall and the Baker Cancer Hospital in 2013. The Children's Hospital was named after Marc Benioff, who donated $100 million toward the new facility. 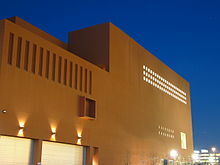 In 2011, expansion also resumed at the Parnassus campus, with the construction of the Regeneration Medicine Building, a $123 million construction designed by New York architect Rafael Viñoly. The Stem Cell Center was named in honor of Eli Broad, who donated $25 million to the cause of research for diabetes, cardiovascular disease, Parkinson’s disease, HIV/AIDS, and cancer. In 2014, UCSF celebrated its 150th anniversary with a year of events. That same year Neonatologist and Dean of the UCSF School of Medicine Sam Hawgood, MBBS, became the tenth Chancellor. In 2015, the Mission Bay campus saw the grand opening of the new UCSF Medical Center at Mission Bay, a 289-bed integrated hospital complex dedicated to serving children, women and cancer patients. UCSF operates four major campus sites within the city of San Francisco and one in Fresno, California, as well as numerous other minor sites scattered through San Francisco and the San Francisco Bay Area. The Parnassus Heights campus was the site of the Affiliated Colleges, which later evolved into the present-day institution. The site was established along Parnassus Avenue in 1898 on land donated by Mayor Adolph Sutro. At the time, the site was in the remote and uninhabited western part of San Francisco, but its medical facilities became vital in saving lives when 40,000 people were hosted in the nearby Golden Gate Park after the 1906 earthquake. In the early 1900s, the medical research operations of the medical center were split between Parnassus and UC Berkeley, and discussions arose about which site should become the center of medical activity. In 1914, the Hooper Foundation for Medical Research decided to move its research work to the Parnassus site, becoming the first medical research foundation in the United States to be incorporated into a university. This expansion led to a 1949 decision by the UC Board of Regents designating the UCSF campus, rather than UC Berkeley, as the main site for all medical sciences of the UC system. The 20th century saw remarkable growth, with the expansion of new research institutes and facilities, which led to the administrative independence of UCSF and the selection of John B. de C.M. Saunders as the first Chancellor in 1964. Parnassus serves as the main campus of the University and includes administration offices, numerous research labs, the 600-bed UCSF Medical Center, the Langley Porter Psychiatric Institute, the Mulberry Student Union, and the UCSF Library. Additionally, the Schools of Dentistry, Pharmacy, Medicine, Nursing are also located at Parnassus. It also houses the UCSF neurology outpatient practice that serves as a referral center for most of northern California and Reno, Nevada. UCSF's Beckman Vision Center is also located at the Parnassus campus. It is a center for the diagnosis, treatment, and research of all areas of eye care, including vision correction surgery. Also located on the Parnassus campus is the UCSF Fetal Treatment Center, a multidisciplinary care center dedicated to the diagnosis, treatment, and long-term follow-up of fetal birth defects. UCSF is also affiliated with the San Francisco VA Medical Center and the J. David Gladstone Institutes, a private biomedical research entity that has recently moved to a new building adjacent to UCSF's Mission Bay campus. They are also affiliated with UCSF Benioff Children's Hospital Oakland (formerly Children's Hospital & Research Center Oakland). UCSF has its own police department, which serves its two major campuses as well as all satellite sites within the city and South San Francisco. UCSF cooperates with the Hastings College of Law, a separate University of California institution located in San Francisco. This includes the formation of the UCSF/Hastings Consortium on Law, Science, and Health Policy. The program offers an LLM and MSL Degree program for health and science professionals. The Philip R. Lee Institute for Health Policy Studies is a partner in this consortium. University of California, San Francisco is unique among University of California campuses in that it performs only biomedical and patient-centered research in its Schools of Medicine, Pharmacy, Nursing, and Dentistry, and the Graduate Division, and their hundreds of associated laboratories. The university is known for innovation in medical research, public service, and patient care. UCSF's faculty includes five Nobel Prize winners, 31 members of the National Academy of Sciences, 69 members of the Institute of Medicine, and 30 members of the Academy of Arts and Sciences. UCSF confers a number of degrees, including Master of Science, Doctor of Philosophy, Doctor of Pharmacy, Doctor of Medicine, Doctor of Dental Surgery, and Doctor of Physical Therapy in a variety of fields. In 2015, U.S. News & World Report ranked the UCSF School of Pharmacy number three in its "America's Best Graduate Schools" edition. In 2014, the School of Pharmacy also ranked first in NIH research funding among all US pharmacy schools, receiving awards totaling $31.8 million. 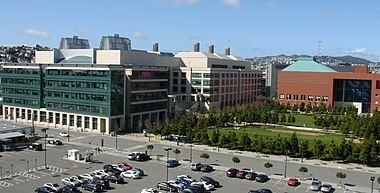 The UCSF School of Pharmacy was also ranked as the top program in the US, according to a 2002 survey published in The Annals of Pharmacotherapy, which weighed key criteria, including funding for research and the frequency of scientific publications by faculty, that are not considered in other rankings. In 2013, the UCSF pharmacy program implemented the multiple mini interview, developed by McMaster University Medical School, as a replacement for the more traditional panel interview as the MMI had shown to be a better predictor of subsequent performance in school. Founded in 1881, the School of Dentistry is the oldest dental school in the state of California and in the Western United States. It is accredited by the American Dental Association and offers the Doctor of Dental Surgery (DDS), PhD in Oral and Craniofacial Sciences, MS in Oral and Craniofacial Sciences, and MS in Dental Hygiene degrees. In 2017, U.S. News & World Report named the UCSF Medical Center the 5th hospital in the nation and the 1st in California. Among pediatric care centers, UCSF Children's Hospital ranked no. 16 – among the highest-rated children's medical service in California. The UCSF Medical Center at Mission Bay opened February 1, 2015 and hosts three hospitals ( UCSF Benioff children's hospital, UCSF Betty Irene Moore Women’s Hospital, and UCSF Bakar Cancer Hospital) and an outpatient facility. Overall, the 6-story medical center covers 878,000-square-foot and has 289 beds. It also has 4.3 acres of green space, including 100,000 square feet of ground landscaping (making it one of the greenest hospitals in the US) and 60,000 square feet of rooftop gardens. UCSF Radiology research programs were ranked second in 2009 in America. The Radiology department is spearheaded by Dr Ronald L. Arenson who is an Alexander R. Margulis Distinguished Professor and also a part of Board of directors of RSNA ( Radiological Society of North America). UCSF students are eligible to become University of California student regent, a position on the University of California Board of Regents created by a 1974 California ballot proposition to represent University of California students on the university system's governing board. Student regents serve an approximately one-year term as 'student regent-designate', followed by a one-year term as a full voting member of the Regents. Virtually any UC student in good academic standing may apply to be student regent. Traditionally, the position alternates between undergraduate and graduate students as well as between the various UC campuses. Elizabeth Blackburn, professor of biology and physiology at UCSF, Nobel laureate in Medicine (2009), discoverer of the ribonucleoprotein enzyme, telomerase. Appointed a member of the President's Council on Bioethics in 2001 and fired in February 2004, reportedly for her public disagreements and political differences with Council chair Leon Kass and the Bush Administration, particularly on the issue of therapeutic cloning. Eric Coleman is an American geriatrician and academic. His is currently a professor at the University of Colorado. His research concerns care transitions. Coleman was awarded a MacArthur Fellowship in 2012. Joseph DeRisi biochemist, specializing in molecular biology, parasitology, genomics, virology, and computational biology, in 2004 was named a MacArthur fellow (the "Genius" award), in 2008 was awarded the 14th Annual Heinz Award for Technology, the Economy, and Employment, and in 2014 he received the John J. Carty Award for the Advancement of Science from the National Academy of Sciences, in 2016 he was elected to the National Academy of Sciences. David E. Garfin, made significant contributions to electrophoresis in both the engineering and biology communities. Michael R. Harrison – developed the initial techniques for fetal surgery and performed the first fetal surgery in 1981, and then went on to establish the UCSF Fetal Treatment Center, which was the first of its kind in the United States. Griffith R. Harsh - Vice Chair of the Stanford Department of Neurosurgery and the Director of the Stanford Brain Tumor Center. He is also the spouse of Meg Whitman. Sarah H. Kagan is an American gerontological nurse, and Lucy Walker Honorary Term Professor of Gerontological Nursing at the University of Pennsylvania. She is a MacArthur Fellow. Stuart Kauffman is an American medical doctor, theoretical biologist, and complex systems researcher who studies the origin of life on Earth. He was a professor the University of Chicago, University of Pennsylvania, and University of Calgary. He has a number of awards including a MacArthur Fellowship and a Wiener Medal. Uzma Khanum, sister of Pakistani Politician Imran Khan. Herbert Daniel Landahl, PhD, Professor Emeritus of Biophysics and Mathematical Biology-Basic research in mathematical biophysics of the central nervous system, cell division dynamics, population interactions, and control of insulin bioynthesis. Michael Marletta is currently Ch and Annie Li Chair in the Molecular Biology of Diseases at the University of California, Berkeley. 1995 MacArthur Fellow. Phillip Thygesson – ophthalmologist, trachoma researcher, Thygesson Disease. Harold Varmus – Nobel laureate in Medicine (1989), worked with J. Michael Bishop to discover the cellular origin of retroviral oncogenes. Also served as director of the National Institutes of Health during the Clinton Administration, as president of Memorial Sloan-Kettering Cancer Center from 2000 to 2010, and currently as the director of the National Cancer Institute. Robert M. Wachter, a prominent expert in patient safety, who coined the term hospitalist and is considered the academic leader of the field of hospital medicine. Wachter is now chair of UCSF's Department of Medicine. David A. Wood former head of the Cancer Research Institute and former president of the American Cancer Society. Pablo DT Valenzuela – co-founder of the American biotech company Chiron Corporation, the first Chilean biotech company Bios Chile, and of Fundacion Ciencia para la Vida in Santiago Chile. Shinya Yamanaka, who developed for reprogramming adult cells to pluripotential precursors, thus circumventing an approach in which embryos would be destroyed. Yamanaka won Shaw prize in 2008 and the Nobel prize for Medicine in 2012. ^ As of June 30, 2018. "Annual Endowment Report for the Fiscal Year Ended June 30, 2018" (PDF). University of California. ^ "Chancellor Announces $5B Campaign to Build for UCSF's Future in 2017 State of the University". University of California, San Francisco. ^ "List of UCSF Chancellors". Archived from the original on August 8, 2014. Retrieved August 4, 2014. ^ "UCSF Overview". UC San Francisco. ^ "UC Financial Reports – Campus Facts in Brief" (PDF). University of California. Retrieved February 2, 2016. ^ "Color | UCSF Brand Identity". Retrieved August 13, 2017. ^ "University of California, San Francisco". July 16, 2015. ^ "UCSF Leads in Academic Rankings, NIH Funding - California Life Sciences Association". March 28, 2011. ^ "UCSF Nobel Prize Winners". UC San Francisco. Retrieved August 17, 2018. ^ "Achievements". UC San Francisco. Retrieved February 2, 2019. ^ "UCSF Is Top Public Recipient of NIH Research Funding for 6th Consecutive Year". UC San Francisco. Retrieved July 15, 2017. ^ "2019 BEST MEDICAL SCHOOLS". Retrieved February 2, 2019. ^ "UCSF Leads in Academic Rankings, NIH Funding". California Life Sciences Association. March 28, 2011. Retrieved February 2, 2019. ^ "UCSF Is Top Public Recipient of NIH Research Funding for 6th Consecutive Year". UC San Francisco. Retrieved February 2, 2019. ^ "UCSF's Graduate School Rankings". US News and Reports. Retrieved February 2, 2019. ^ "Public Agency Employers: Ranked by Bay Area employees". www.bizjournals.com. Retrieved July 10, 2017. ^ Hugh Huger Toland (1806–1880), UCSF, Accessed October 6, 2010. ^ a b A History of UCSF: San Francisco's First Medical Institutions, UCSF, Accessed October 6, 2010. ^ a b c A History of UCSF: University Affiliation, UCSF, Accessed October 10, 2010. ^ Chronology of the Stanford University Medical Center, Stanford School of Medicine, Accessed June 11, 2007. ^ Chen, Jeffrey. "140 Years Later: The First Female Graduate of UCSF". UCSF School of Medicine. Retrieved December 18, 2013. ^ "A History of UCSF". The Regents of the University of California. Retrieved November 26, 2013. ^ "John B. de C. M. Saunders - Biography - A History of UCSF". history.library.ucsf.edu. ^ "Willard Corwin Fleming - Biography - A History of UCSF". history.library.ucsf.edu. ^ "Philip Randolph Lee - Biography - A History of UCSF". history.library.ucsf.edu. ^ "Francis A. Sooy - Biography - A History of UCSF". history.library.ucsf.edu. 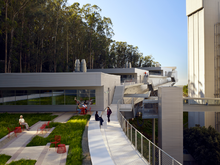 ^ "Laurel Heights | UC San Francisco". www.ucsf.edu. ^ "Mission Bay". UC San Francisco. ^ "J. Michael Bishop: Scientist, UCSF Chancellor, and Nobel Laureate". UC Berkeley Library Update. May 24, 2018. Retrieved July 13, 2018. ^ "Susan Desmond-Hellman - Biography - A History of UCSF". history.library.ucsf.edu. ^ "UCSF Children's Hospital receives $100 million gift to build new hospital". UC San Francisco. ^ "UCSF 150: Celebrating UC San Francisco's 150th Anniversary". ^ Anwar, Yasmin (September 21, 2016). "UC Berkeley to partner in $600M Chan Zuckerberg science 'Biohub'". Berkeley News. Retrieved July 10, 2017. ^ Korn, Melissa (January 12, 2017). "San Francisco University UCSF Receives $500 Million Gift". Wall Street Journal. ISSN 0099-9660. Retrieved January 12, 2017. ^ "UCSF unveils $5 billion campaign to boost health and science initiatives". www.bizjournals.com. Retrieved February 23, 2018. ^ Ravven, Wallace (July 22, 2003). 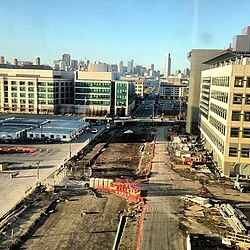 "New UCSF Mission Bay campus: country's largest biomedical university expansion". UCSF News Center. Retrieved November 30, 2016. ^ "University of California and Genentech Settle Patent Infringement Lawsuits" (Press release). Genentech Inc. November 19, 1999. Retrieved October 18, 2012. ^ "$25 Million Gift Creates Professorship for UCSF Chancellor, Furthers Construction of Mission Bay Campus". Insider.ucsf.edu. February 1, 2005. Archived from the original on February 9, 2012. Retrieved April 26, 2012. ^ "QB3's Inaugural Event Features Announcement of Major Partnerships with Industry". Pub.ucsf.edu. Archived from the original on July 5, 2008. Retrieved April 26, 2012. ^ Tansey, Bernadette (November 29, 2007). "UCSF to name building after biotech pioneer Bill Rutter". San Francisco Chronicle. Archived from the original on January 8, 2008. Retrieved November 29, 2007. ^ Rauber, Chris (October 12, 2007). "Invention, born of necessity". San Francisco Business Times. Retrieved February 11, 2008. 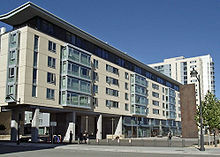 ^ "UCSF Medical Center at Mission Bay". Archived from the original on July 25, 2010. Retrieved October 1, 2014. ^ "Trauma Care". UCSF School of Medicine. Archived from the original on December 3, 2013. Retrieved November 26, 2013. ^ "Verified Trauma Centers". American College of Surgeons. Retrieved November 26, 2013. ^ Cochrane, Michelle (2004). When AIDS Began: San Francisco and the Making of an Epidemic. New York: Routledge. p. 61. ISBN 0415924294. ^ "US News Best Graduate Schools | Top Medical Schools | Best AIDS Programs". U.S. News & World Report. Archived from the original on December 2, 2013. Retrieved November 26, 2013. ^ "AIDS Research Institute Fact Sheet" (PDF). University of California at San Francisco. Archived from the original (PDF) on June 21, 2013. Retrieved November 26, 2013. ^ "A History of UCSF: people". Retrieved October 1, 2014. ^ Heilig, Steve "Health Policy Gurus Gather: The UCSF Philip R. Lee Institute for Health Policy Studies at 40" Huffington Post. (March 19, 2013). Retrieved June 1, 2013. ^ "UCSF/Hastings Consortium". Uchastings.edu. Archived from the original on June 1, 2010. Retrieved July 29, 2010. ^ a b "University of California, San Francisco - U.S. News Best Grad School Rankings". U.S. News & World Report. Retrieved June 9, 2017. ^ a b "Academic Ranking of World Universities in Clinical Medicine and Pharmacy - 2016 - 2016 Top 100 Universities in Natural Sciences and Mathematics - ARWU-FIELD 2016". www.shanghairanking.com. ^ "UCSF | Best Medical School | US News". Grad-schools.usnews.rankingsandreviews.com. Retrieved February 2, 2019. ^ "Achievements". UC San Francisco. ^ "Facts & Figures | UCSF School of Medicine". medschool.ucsf.edu. ^ Douglass, John; Thomas, Sally. "University of California History Digital Archives: San Francisco Historical Overview". www.lib.berkeley.edu. Retrieved February 4, 2019. ^ a b c d "UCSF Is Top Public Recipient of NIH Research Funding for 6th Consecutive Year". UC San Francisco. ^ "UCSF Tops Public Institutions in NIH Funding, Ranks Third Overall" (Press release). UCSF. February 15, 2011. ^ "UCSF Tops Medical Schools, Public Institutions In NIH Research Funds" (Press release). UCSF. July 16, 2013. ^ "The UCSF Bridges Curriculum". UCSF. April 22, 2018. ^ "Successful Applicant Profile: Class of 2021 - UCSF Medical Education - Admissions". meded.ucsf.edu. Archived from the original on June 15, 2016. Retrieved June 21, 2016. ^ a b c "UC San Francisco Graduate School Rankings". U.S. News & World Report. Archived from the original on December 6, 2012. Retrieved November 17, 2012. ^ a b Bole, Kristen (February 26, 2014). "UCSF Schools Lead Nation Again In NIH Biomedical Research Funds". Pub.ucsf.edu. Retrieved March 10, 2015. ^ "QS World University Rankings by Subject 2015 - Dentistry". Quacquarelli Symonds. 2015. Retrieved August 26, 2015. ^ "''US News and World Report'' rankings of best hospitals". Usnews.com. Retrieved April 26, 2012. ^ Comen, Evan. "10 Universities Spending Billions on R&D". 247wallst.com. ^ "John Michael Bishop - Biography - A History of UCSF". history.library.ucsf.edu. Retrieved September 8, 2017. ^ Cohen, Stanley N. (September 24, 2013). "DNA cloning: A personal view after 40 years". Proceedings of the National Academy of Sciences of the United States of America. 110 (39): 15521–15529. doi: 10.1073/pnas.1313397110. ISSN 0027-8424. PMC 3785787. PMID 24043817. ^ "Dean Mary Anne Koda-Kimble | School of Pharmacy | UCSF". pharmacy.ucsf.edu. Retrieved February 21, 2018. ^ "Patient Care | School of Pharmacy | UCSF". pharmacy.ucsf.edu. Retrieved February 21, 2018. ^ Bunim, Juliana (September 26, 2013). "University of California, San Francisco Press Office". Retrieved August 28, 2014. ^ "9-way kidney transplant chain underway in San Francisco". June 5, 2015. ^ Marzullo, Katie (June 5, 2015). "18 people involved in kidney transplant in San Francisco". ^ "Rare 9-way kidney swap a success, San Francisco doctors say". June 6, 2015. ^ "Registered Campus Organizations - UCSF Student Life". studentlife.ucsf.edu. ^ "Graduate & Professional Student Association - UCSF Student Life". studentlife.ucsf.edu. ^ "UCSF Synapse Archive". synapse.library.ucsf.edu. ^ "Synapse - UCSF Student Life". studentlife.ucsf.edu. ^ "University of California, San Francisco (UCSF)". archive-it.org. ^ Writer, MARY BETH SCHWEIGERT Staff. "One good turn for 'Bachelor' Andy Baldwin". LancasterOnline. Retrieved March 7, 2018. ^ "Laura Esserman Named to TIME 100 List of Most Influential People in the World". Retrieved September 5, 2016. ^ "Stanton Glantz, PhD | Center for Tobacco Control Research and Education". tobacco.ucsf.edu. Archived from the original on December 4, 2010. Retrieved March 7, 2017. ^ Altman, Lawrence K. [ "Dr. Dorothy Horstmann, 89; Made Strides in Polio Research"], The New York Times, January 21, 2001. Accessed January 21, 2001. ^ "William Seeley: Neurologist"[ permanent dead link], John D. & Catherine T. MacArthur Foundation. Wikimedia Commons has media related to UCSF—University of California, San Francisco.